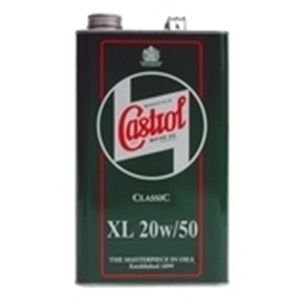 Castrol Classic XL 20w/50 is a conventional multigrade engine oil of good all round performance, formulated with high quality mineral oils plus selected additives, ideally suited to older technology and classic car and classic motorcycle engines. Castrol Classic XL 20w/50 offers excellent oil consumption and a high level of engine wear protection. Please note: Metal oil cans may arrive dented. As long as they are not leaking this is viewed by us as acceptable. If you would like the guarantee of an un-dented can, we advise you to collect in person.